You gotta try it: Ingredient of the month - Black Pepper! Hope this New Year 2019 is treating you all well. I started writing about ingredients from end of last year, starting with Bird's eye chili. This month's ingredient is 'Black Pepper' which is from my in-laws place (100% home grown :) ). 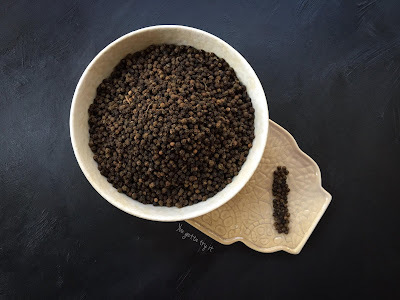 Black pepper (Piper Nigrum) known as ‘King of spices’ (also known as black gold in ancient times), is one of the widely used spices in the world. With the presence of more than 3000 years in the history, this was one of the major reasons for significant spice trades of India with other nations. Explorers like Vasco Da Gama and Christopher Columbus came to India for this spice. According to researches Black pepper was originated in the Western Ghats of Kerala. With plenty of medicinal values this black beauty is one of my favorite spices and even for a simple cold and cough, the first ingredient we search in the kitchen will be pepper. Black pepper is an excellent source of antioxidants, Vitamin K, Potassium, Iron, Calcium, Dietary Fiber etc. Black Pepper contains ‘Piperine’ which combined with Turmeric has wonderful health benefits and act as an antidepressant, reduces bloating, help to lose weight, boosts memory and immunity, helps to prevent diabetes, cancer; reduces cholesterol, bad breath, cough and throat diseases etc. So start adding pepper in your daily diet and home remedies.